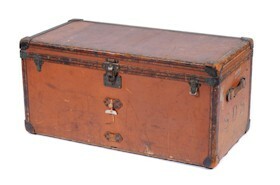 A Louis Vuitton trunk (number 502780) sold for £2,300 at auction. In an era where much is currently made of the decline in prices for 'brown furniture', the British have yet again succeeded in what they do terribly well – that of talking things down. And yet it is not all doom and gloom – indeed far from it. There is strong demand for good English furniture from the 17th to the 20th Centuries. A good example of this was a George III mahogany serpentine fronted serving table measuring 8ft long which sold for £21,000 against a £6,000 - £8,000 estimate. Whilst you can readily buy a good Georgian or Victorian chest of drawers at auction for a few hundred pounds, the storage provided by a Louis Vuitton trunk will cost rather more. Two examples of Louis Vuitton trunks were sold by Bearnes Hampton & Littlewood recently. A leather bound rectangular trunk number 502780 measuring 3ft 8in long sold for £2,300, whilst a Louis Vuitton canvas and batten rectangular trunk of a similar size sold for £15,000 against a pre-sale estimate of £500-£700. Desks have also provided an interesting comparison. A standard mahogany pedestal desk can be bought for around £400-£600. A particularly good example of an early 19th Century partners pedestal desk was sold in our January fine art sale for £3,100. Compare that with an oak kneehole desk made in the 20th Century by Heal and Son Ltd, which sold for £1,800. A further example of the trend towards the 20th Century is provided with an oak octagonal occasional table by Robert Thompson of Kilburn, also known as 'Mouseman' Thompson because of the distinctive mouse carved on each piece of furniture. This table was hotly competed for the saleroom achieving a final price of £1,250 against a £500-£700 estimate. Contrast that against a George III mahogany circular occasional table; examples of which can be brought for two or three hundred pounds. For those who prefer a rather more unusual occasional table, examples of which can be bought for two or three hundred pounds. For those who prefer a rather more unusual occasional table, an Anglo Indian teak table modelled as a camel supporting a brass tray recently sold for £3,400. The trend towards the 20th Century continues, but good middle range Georgian and Victorian furniture is very affordable and its time will come again, proving to be an excellent investment for those who have the sense to buy it now. Furniture Trends was written on Monday, 12th March 2012.